For fans of Kingmaker—which I reviewed in 2014—the good news is that Gibsons will be bringing it back and republishing it. 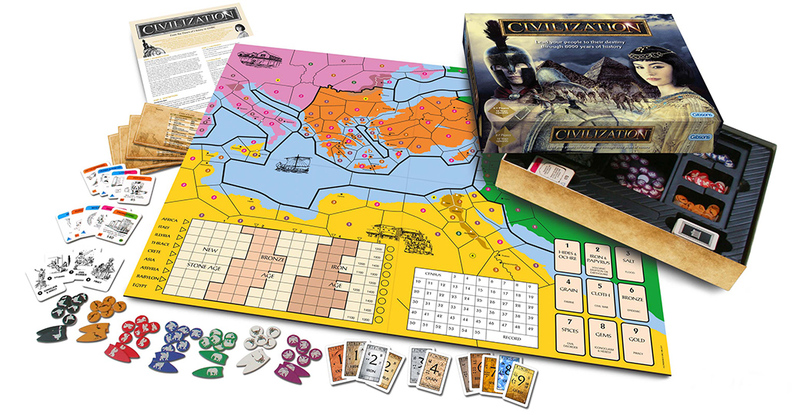 Equally as good news is that the publisher has in the meantime, republished another classic board game of that era—Civilisation. This is the father of all board games in which players build and develop their civilisations, from 7 Wonders and Antike to Stone Age and Tzolk’in: The Mayan Calendar, but this is no Euro game—and it is definitely not Ameritrash. It is a game that is epic in theme, epic in scale, and epic in terms of play. Its theme is that of its name: the founding of a civilisation, the growth of its population, and the advancement of knowledge, that will take its people out of the Stone Age and through the Bronze Age into the Iron Age. Its scale is from the Stone Age until 250 BCE, some eight thousand years, five hundred years at a time, all played out across the birthplace of classical civilisation—the Eastern Mediterranean. Its terms of play are epic in that it is designed for up to seven players and the full game takes as long as eight hours! Originally published in 1980 by Hartland Trefoil and then Avalon Hill in 1981, Civilisation would win the Charles Roberts Award for Best Pre-20th Century Boardgame of 1982. Later published by Gibsons in 1988, it has been out of print for some years, but Gibsons have brought it back out once again, to no little fanfare. Indeed, at UK Games Expo 2018, it won the Judges’ Award for Best New Board Game (Strategic Style). In Civilisation, each player takes control of one of seven cultures—Africa, Asia, Assyria, Babylon, Crete, Egypt, and Illyria (or Thrace)—and as nations, spread out from one territory to another, grow their populations, build cities and tax them, acquire goods and trade with other nations, acquire technologies in the arts, crafts, sciences, and civics, and so on. Sometimes they will war with their opponents, but it should be made clear that Civilisation is no wargame, and often, they will suffer calamities that their peoples must weather if they are to advance. The key to winning and thus developing the greatest civilisation the technologies, represented by Civilisation Cards, which provide both an in-game benefit and points, for without them, a player’s nation cannot advance through the epochs of time… All of this involves both Area Control and Area Influence mechanics and Hand Management, Set Collection, and Trading mechanics. The game does not use dice and there are no random elements to the game. Designed for two to seven players, aged twelve and over, Civilisation consists of five of components—the board, seven sets of counters, seven Playmats, a set of Trade and Calamity Cards, a set of Civilisation Cards, and a rulebook. The large board depicts the Eastern Mediterranean divided into four differently coloured regions—Italy and the Balkans, Greece and Asia Minor, the Levant and the Middle East, and Egypt and North Africa, further divided into zones. Each zone is marked with a number indicating the maximum number of Population Tokens it can hold. Some are marked with a square to indicate a city site, a zone where cities are cheaper to build. Several zones are marked with floodplains and volcanoes and Population Tokens and cities in these zones are particularly vulnerable to floods and volcanic eruptions or earthquakes—both represented by Calamity Cards. The lower quarter of the board is given over to spaces for the Progress Track, the Census Track, and a display area for the Trade and Calamity Cards. The Census Track is used to record a civilisation’s population total, from one turn to the next, whilst the Progress Track is used to determine how far a civilisation has advanced. It is divided into five epochs across the New Stone Age, the Bronze Age, and the Iron Age. Each player and his civilisation with advance one square each turn until he reaches the end of an epoch. If the requirements of the next epoch have been fulfilled, then they can continue their progress. To enter the second epoch, a player and civilisation must have two cities; to enter the third, they need three Civilisation Cards from three different categories; to enter the fourth, they need seven Civilisation Cards; and to enter the fifth, they need Civilisation Cards with a total value of a thousand points. At the end of the track is a point value a player needs in terms of Civilisation Cards, his treasury, and the value of any Trade Cards, his civilisation needs to advance to the very end of the game. It should be noted that length of the various epochs varies from civilisation to civilisation, as does the total number of points required at the end. This is a balancing mechanism to reflect a lower capacity to support high populations. Each set of counters consists of fifty-six Population Tokens, twelve City Tokens, and four Ships. Each set is done in a strong colour and marked with an easy to spot symbol. The play mats have spaces to store a player’s stock of tokens and a civilisation’s Treasury. The play mat also lists the game’s thirteen phases. The Trade Cards consist of eleven commodities, which have a value between one and nine. They include Ochre, Hides, Iron, Papyrus, Salt, Grain, Cloth, Bronze, Spice, Gems, and Gold. They used to trade with other players, as well as to purchase Civilisation Cards. The more Trade Cards of a single type a player has, the more valuable they are. For example, each Ochre Trade Card has a value of one, but two have a value of four, three have a value of nine, four have a value of sixteen, and so on. There are eight Calamity Cards—Civil Disorder, Civil War, Epidemic, Famine, Flood, Iconoclasm & Heresy, Piracy, and Volcanic Eruption or Earthquake—which are marked with either red or black backs. The red-backed Calamity Cards—Civil War, Famine, Flood, and Volcanic Eruption or Earthquake—affect the player who draws them, but the black-backed Calamity Cards—Civil Disorder, Epidemic, Iconoclasm & Heresy, and Piracy—do not affect the player who draws them, but can be traded away to rival players who will be affected by them. The Civilisation Cards are divided into four categories—Arts, Crafts, Sciences, and Civics, though some do falls into two categories. Each has a name, a cost to purchase using a mix of Trade Cards and Population Tokens, the possible credits it provides to purchase other Civilisation Cards, and an advantage, either reducing the effect of a Calamity Card or providing some sort of bonus. For example, Democracy reduces the effects of both Civil Disorder and Civil War; Cloth Making gives ships an extra move; and Coinage allows for changes in taxation. In addition, the cost of each Civilisation Card also represents the total value it contributes towards a player’s civilisation. So as well as costing two hundred points, Democracy increases a civilisation value by two hundred points. What is interesting about these cards is that some do posses prerequisites, Civilisation Cards which have to be purchased before a player can purchase the desired Civilisation Card and some Civilisation Cards provide points that can only be spent on specific Civilisation Cards. For example, Law is required before a player can purchase either Democracy or Philosophy, whilst Literacy provides twenty-five points which counts towards the purchase of Law, Democracy, and Philosophy. So what you have here is a rough ‘Tech Tree’, a path which leads from one technology or advance to the next, each relying upon the preceding ones to work and understand. Now it is only rudimentary, but it was the first time that such a mechanic appeared in a boardgame. Of course, it would not be the last. There is one possible issue with the Civilisation Cards and that is the total number that a player can hold—eleven. If a player purchases too many of the cheaper Civilisation Cards, he may not gain enough points to advance along the Progress Chart and so win the game. So he needs to be careful in what Civilisation Cards he purchases. Game set-up is relatively straightforward. The Trade Cards are placed on their respective spaces on the board with the Civilisation Cards alongside the board. Each player chooses a civilisation—this being done in randomly determined order—and places a City Token and a Population Token in their civilisation’s starting zone. Each player places tokens on the Progress and Census Tracks. The number of players determines which civilisations and which regions are used in a game (though oddly, Italy is not included in the locations, pointing towards needing a second edition of the rulebook). Each player puts his Population Tokens into his Stock space on his Play Mat; these will move into his Treasury space as the game proceeds where they can be spent. Game play in Civilisation consists of thirteen phases! These are ‘Collect Taxation’, ‘Population Expansion’, ‘Census’, ‘Construct Ships’, ‘Movement’, ‘Conflict’, ‘Build Cities’, ‘Acquire Trade Cards’, ‘Trade’, ‘Acquire Civilization Cards’, ‘Resolve Calamities’, ‘Return Excess Trade Cards’, and ‘Alter Progress Marker’. This looks like a lot, but many of these phases are quite simple and relatively short. Some though are quite involving, and they are the meat of the game. In the ‘Collect Taxation’ phase, a player adds two tokens from his Stock into his Treasury for each city his civilisation has; in the ‘Population Expansion’ phase, he adds Population Tokens to the zones in which he already he has Population Tokens; and in the ‘Census’ phase, he counts up how many Population Tokens has has on the board to determine his turn order in the ‘Movement’ phase. In the ‘Construct Ships’ phase a player builds ships and pays the upkeep costs of the ships he already has. Ships allow a player to pick up and drop off Population Tokens as they sail along the coast. Once his civilisation acquires the Astronomy Civilisation Card, a player’s ships can cross the open sea zones on the map. Ships allow Population Tokens to move longer distances and en masse. In the ‘Movement’ phase, a player can move as many of his Population Tokens he wants one space each and ships up to four spaces each. The ‘Conflict’ phase is where the game begins to get interesting. Each zone has a population limit. If two or more players have Population Tokens in a zone that together exceed this limit, then war ensues. Cities are considered to be equal to six Population Tokens, so war always ensues if another player moves into that zone. Its resolution is quite simple—the players take it in turn to remove one Population Token, starting with the player with the fewest number in the zone. This continues until the zone’s population limit is not exceeded. In this way, the player with the highest number of Population Tokens will defeat the other. It is also possible to attack and sack a city, but this requires an invasion with at least seven Population Tokens by the attacking player. In the ‘Build Cities’ phase, if a player has six or more Population Tokens on a zone with a square, he can build a city. If the zone has no square, it needs twelve Population Tokens. Any Population Tokens in excess of the population limit on any zone are returned to the player’s stock as those zones cannot support them. Cities need to be supported by two Population Tokens each in play and the maximum number of cities a player can have is nine. It is possible to lose a city if it not sufficiently supported. Once a player has determined the total number of cities he has, in the ‘Acquire Trade Cards’ phase, he can draw one Trade Card for each city he has. This is mandatory, and a player must draw one Trade Card from each stack starting at the first and going up in order. There is the chance that a player will draw a Calamity Card during this phase. The red-backed Calamity Cards are obvious in play and will affect the player who draws them, whilst the black-backed Calamity Cards are kept secret and can be traded in the next phase. The ‘Trade’ phase is open to everyone, players bartering with each other in attempt to get more cards of a single type as together they are more valuable. Trading is necessary because in the ‘Acquire Trade Cards’ phase, a player can only acquire a single card of any of the trade goods available. To trade, a player has to offer at least three cards, declaring both what one of the cards is and what the total value of the cards are. So for example, a player might say, “I want Bronze. For that, I am willing to trade Cloth. My three cards have a total value of nine.” Since the value of Cloth is five, the other players may have some idea as what the other Trade Cards might be as they must add to four to make the total of nine. So they might be Salt and Ochre, worth one and three respectively, or they might be a Grain card, worth four on its own, and a Calamity. The ‘Trade’ phase can last as long as the players want or a time limit can be set, but in order to trade, a player needs a minimum of three Trade Cards. Using the combined value of his Trade Cards and possibly tokens from his Treasury, a player can buy in the ‘Acquire Civilization Cards’ phase. A player can only buy one Civilisation Card of any one type, but can buy multiple Civilisation Cards on his turn. Expended Trade Cards back on the bottom of their respective decks on the board. The effect of Civilisation Cards come into play as soon as a player acquires them. This can be important because some of them ameliorate the effects of Calamity Cards. For example, a player who holds Grain Trade Cards can offset the effects of the Famine Calamity Card if he also has the ‘Pottery’ Civilisation Card. In the ‘Resolve Calamities’ phase, civilisations suffer the effects of the Calamity Cards their players have either drawn—if red backed—or received in a trade—if black backed. No civilisation can suffer the effects of more than to Calamity Cards in a player’s turn. What is interesting is that many of the Calamity Cards do not just affect the player holding them in the ‘Resolve Calamities’ phase—they can affect rivals too. For example, the Famine Calamity Card forces a player to lose nine Population Tokens, but he can instruct the other players to lose up to twenty between them as well. The Epidemic Calamity Card works in a similar fashion. All resolved Calamity Cards go back at the bottom of the Trade Card decks they are drawn from. Lastly, in the ‘Return Excess Trade Cards’ phase, each player reduces the number of Trade Cards he can hold to six, and in the ‘Move Progress Marker’, each player moves his marker on the Progress Track along one space, taking into account the requirements to move into each of the epochs. Once done, the turn is over, and the next one proceeds until the game ends and there is a winner. It should be pointed out that not all of the phases will necessarily come into play, especially in the early part of the game where the players will be primarily concerned building their civilisation’s population up enough to build a city. Once a player has a city or three, then the game picks up and becomes more complex as trading increases in importance. Once this happen, Civilisation becomes a balancing act between a player’s Cities, Population, Stock, and Treasury. Not enough Population Tokens and Cities will collapse; not enough Tokens in his Stock for Taxation and a player’s Cities will Revolt and join another civilisation; not enough Population Tokens and a player make not be able to withstand an invasion by a rival. Notably though, the Calamity Cards can upset these balances and a civilisation that suffers the effects of one too many Calamity Cards can greatly hinder or destroy a civilisation. Coming back from these effects can be challenging, but they can be offset with the right Civilisation Cards. The fact that once their effects have been applied, the Calamity Cards are returned to respective Trade Card decks means that they will cycle through the game, appearing again and again, throughout the game and history. The Calamity Cards also serve as a means to rein in any civilisation which advances too quickly in comparison to its rivals, although of course, its player needs to be amenable to trades. Otherwise, a runaway civilisation may be difficult to catch up with. The big issue with Civilisation is its playing time and the commitment this requires. A playing time of six to eight hours for the full game is not be sniffed at and takes dedication upon the part of the players. The game is also longer the more players there are involved, but that said, the game players better the more players there. Not only is the competition for territory fiercer, but there are more opportunities for trade and interaction, for forming alliances, and so on. Nevertheless, Civilisation is no casual game. That said, the rulebook does offer options for simpler versions of the game and shorter versions of the game. The simplest version, ‘The Game of Nomads and Seafarers’ omits most of the phases and therefore the rules, whilst the ‘The Game of Farmers and Citizens’ omits just a few of them. The shortened versions use the full rules, but play stops after the winner reaches the ninth, twelfth, or fourteenth space along the Progress Track rather than the sixteenth. Of these, ‘The Game of Nomads and Seafarers’ is too simple, whereas ‘The Game of Farmers and Citizens’ serves as a better means by which to learn the basics of the game. The designer, Francis Tresham, has said of Civilisation, “I regard this game as my masterpiece.” It easy to see why. No game does the sweep of history quite as well as Civilisation, the players being able to chart the rise—and possible fall—of cultures and civilisations over the course of centuries, spreading out to build cities, discover their neighbours and trade with them, make advances in knowledge and belief, go to war and withstand calamities, and perhaps, survive long enough to become the greatest of civilisations. It does all this—eight thousand years of history—with simple, elegant mechanics that are easy to learn and easy to play, but not necessarily easy to master as there are some subtle nuances to them. Civilisation is a classic piece of board game design and an influence on many games since, a great strategy game and a great history game. Gibsons should be applauded for making it available once again.